Tailwheel training is what makes good pilots better pilots. Having earned your private or sport pilot certificate is a great accomplishment, however most pilots will agree that you aren’t a true pilot until you’ve earned your tailwheel endorsement. The FAA must think so too because unless you logged pilot-in-command time in a tailwheel airplane before April 15, 1991, you must be trained and endorsed to act as pilot-in-command of one now. Furthermore, your recency of experience requires that in order to take passengers in a tailwheel aircraft, you must have made three take-offs and landings to a full stop in the previous 90 days. That’s because the tailwheel has unique handling characteristics on the ground that require an attentive pilot with refined coordination and sharp rudder skills. 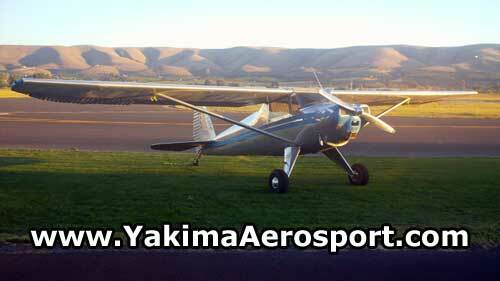 Yakima Aerosport offers tailwheel training and our owner, Mike Butterfield, is one of the few people in the Yakima Valley that can sign off your tailwheel endorsement. If you have any questions about this process, then please contact us or stop by our hangars at the Yakima airport. Earning your tailwheel endorsement will open up another world of new and exciting aircraft ranging from homebuilts to light sports to certifieds that you can now legally fly.